Mung Bean alternatively known as moong bean or green gram is a plant species in the legume family. Mung bean are commonly used in various Cuisines across Asia. Mung bean is a high source of protein, fiber, antioxidants , copper, zinc and B vitamin. Mung beans can help lower high Cholesterol levels and protect against heart disease. Helps lower high Blood Presser, can prevent or treat type 2 diabetes and helps with Weight loss. Today's recipe is a simple and delicious stir fry with moong dal, can be served as it is as a evening snack or as a side dish with rice or roti. Wash moong dal and presser cook with 2 cups water. 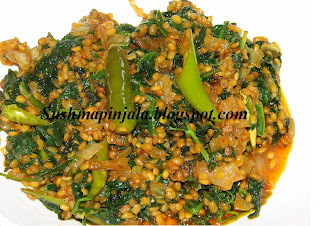 Spinach and Moong dal is a great combination. This quick and healthy dish goes well with roti or with plain rice too. Adding lot of garlic to this gives nice flavor and taste too. This recipes goes to the 3rd day of BM 74 for the 4th week, under the theme " Quick and Delicious Stir- fries". Heat oil in pan and add chopped onions and slit green chillies. Saute and add crushed garlic and cook till raw smell dissappears and onions are slight brown in color. Now add moongdal and fry for few mits. Now add washed and chopped spinach/ palak. Saute for few mits and add slat, haldi and chilli powder. Do not add water. Cook on medium flame till water whcih comes from spinach disappears. Transfer to bowl and serve hot with rice or roti. Check to see what my fellow bloggers are cooking for BM 74. Chikkudukaya is a kind of beans mostly found in Indian stores. They are of different types, some with seeds inside some without. Some are light green in color some dark and some purple too. It tastes great if you cook with onions, tomatoes and some spices as a gravy curry or just stir fry with some chopped onions and spices. Today I have made this simple and delicious stir fry to go with rice or roti. This recipe goes to the 2nd day of week 4, Blogging Marathon 74 under the theme " Quick and Delicious Stir- Fries". Trim the edges of the beans and wash.
Cut the beans into small pieces. Heat oil in pan, add curry leaves, chopped onion and green chilies. Saute till onions turn light golden brown. Now add cut broad beans, salt and haldi. Sprinkle some water and cook for 5 to 7 minutes with lid on. Crunchy, spicy and garlicky green beans tastes wonderful with some Asian Noodles or with any Fried rice. A quick and delicious side dish. Stir fry the beans till nice and tender and serve hot. This recipes goes to week 4, day 1 of BM 74 under the theme " Quick and delicious Stir- Fries". Trim green beans and wash thoroughly. Heat oil in a pan / wok. Add beans and 2 spoons water, cover and cook for 10 minutes on medium heat. Now add chopped garlic and bell pepper. Also add soy sauce and hot sauce. Saute for few minutes till beans are nice and tender. Serve hot with noodles or any rice dish. Pineapple has an ability to improve respiratory health, digestion, cures cold and coughs and helps in weigh loss too. Boosts immunity and improves blood circulation. Pineapple can be consumed fresh, cooked, juiced or preserved. Flesh and juice of the pineapple are used in Cuisines around the world. Chunks of pineapple are used in desserts such as fruit salads, puddings, cakes and also in savory dishes like pizza toppings. Today for day 3, week 3 of BM 74, am here with a yummy desert " Pineapple Pudding", under the the theme " Are you pudding me?" If you are using pineapple chunks, blend it to smooth puree. In a sauce pan add the puree and sugar. Cook on low to medium flame till sugar dissolves completely and the mixture becomes 1/3 quantity. Now add eggs and beat nicely. In a bowl ( steel vessel) add the mixture. Chia seeds have become one of my favorite ingredients, I add them in smoothies, puddings, oatmeal, cookies and fruit Popsicles too. Chia seeds are full of fiber, Omega-3 fatty acids, protein, carbohydrates and calcium. On the other hand Blueberries are the most nutrient dense berries which contains Fiber, Vitamin C and K.
Blueberries and Chia seeds make a great combination to make smoothies or puddings. Today I am here with a great pudding recipe with these 2 Ingredients, which is perfect as a breakfast, dessert or snack. I have used fresh banana and blueberries for the recipe but, it would taste best if you use frozen berries and banana for the recipe. You can use honey or sugar instead of dates for the sweetness. This recipe goes to the 3rd week, day 2 of BM 74 under the theme " Are you Pudding me?" Add all the ingredients except Chia seeds into blender. Mango sago pudding is made with cooked sago and fresh mangoes. Mangoes are soon going to be in market and this is a great dessert for your friends and family. I have used canned mango pulp here, but if you find fresh mangoes please go ahead and use them. I am not adding any sugar to this recipe as the sweetness from condensed milk is just perfect for it. If you like to add more sweetness add 2-3 spoons sugar or 2 spoons honey. Wash and soak sago for 1 -2 hrs. Add 1/2 cup more water and presser cook for 1 whistle. Let cool down completely to drain the water. In a blender add condensed milk, milk and mango pulp. Chili Garlic sauce is a dip / seasoning sauce usually found in Thai / Chinese Restaurants / Stores. Soak the whole dry red chilies in boiled hot water. Drain water, using wooden spoon or any other spoon press the chilies gently to remove the excess water. Let rest for another 5 - 10 minute. Now remove the stems of the chilies if any. Transfer the chilies, peeled garlic, salt, sugar and vinegar into blender. Transfer to air tight container and refrigerate for up to 1 month. Thoroughly wash cilantro and mint leaves. Add few spoons water to make smooth paste. Remove and transfer to air tight container. Store in refrigerator for later use. An apple a day keeps the doctor away. You might have heard about this English proverb. Not only apple infact , consuming fresh fruits daily keep us more healthy and fit. As we are talking about apples lets make apple sauce today. Apple sauce is made with fresh apples. Nothing beats the taste and that freshness of any home made sauces. Apple sauce is one of them. Just peel, cut, season and cook. You can add maple syrup or honey instead of sugar. Vanilla extract is also completely optional.